As if you didn't already know I am a decor obsessed individual. I truly believe in the interior of a home being a haven. The home is the only place in the world where you can let your hair down and de-stress or just relax from the heartless place the world can sometimes be. From the moment I moved into my own first place (years and years ago) my priority was to make my apartment my place of zen and in my opinion the key to finding your zen is to exist in a place free of clutter and mind contaminating unfinished projects. So enough with my rambling, after six years of being in our home I've decided it's time to complete some things that I've wanted to do around the house for a while. Time has always been an issue until now. As of late I am frequently checking off my home decor to do list and I am entirely too happy about the simplest projects. 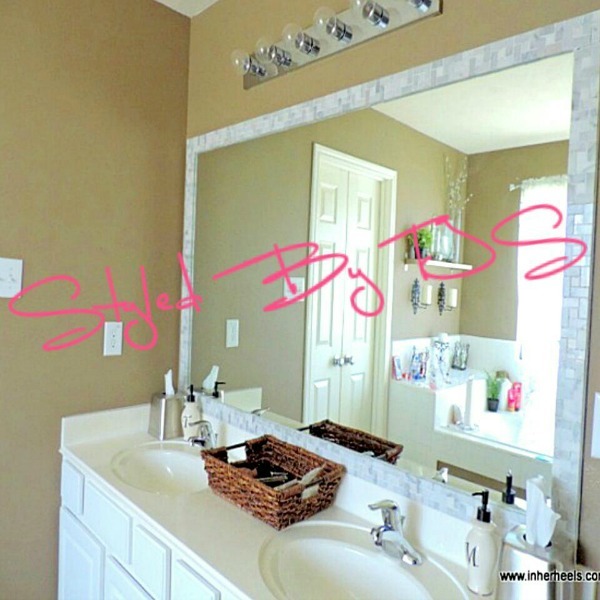 So here I am sharing a quick and simple way to upgrade your frame-less bathroom mirror. First take your 12x12 sheet of tile and cut the tile according to your desired look. You aren't literally cutting the tile. You are cutting the backing on the tile which holds the pieces together. I am sure there is a technical name for that but I don't have the time to Google as I type this up! As you can see with this tile in particular I was able to cut five individual strips. With this design in particular five is the most that can be achieved per 12x12 sheet. Here's a close up of what your pre-mixed adhesive should look like. ...and the adhesive and tile application. With this marbled tile in particular it is pretty heavy. With that being said once you reach the top of the mirror you will need to take your time as the tile will slip a bit due to the weight of it. Due to this I used a good amount of adhesive for the top application and held the tile in place with a grout float for a few minutes. I repeated this step a few times to ensure the accuracy of the line. I also adjusted my thermostat to 65 to help speed up the process. Once your tile has a good adhesive grip, take your sponge and wipe off the excess adhesive. You should have adhesive coming through the tile you are applying. If this isn't the case you probably did not apply enough pressure against the tile to the adhesive and mirror. Be sure to apply enough pressure to the tile. Once the adhesive is applied allow it to dry over night and you will wake up to your finished product. Go ahead and grab your glass cleaner and wipe away. After completing the master mirror I got a bit over zealous and could not wait to start the mirror in my children's bathroom. Basically I forgot to take a before pic but you get the idea here! This is about half way through the job. Be sure to cut off the edges of the paper that holds the tiles together. This will help you achieve a clean and finished look. I am just about done with mirror number two. Clean up is still in progress as you may notice on the top left corner. The great thing about the adhesive is it rubs right off with a wet sponge. Adding soap to the water gives it a little added kick as well. I have to say that I am totally in love with my newly framed mosaic mirrors! My master mirror at 70 W x 42 H in size cost a total of $ 47.92. I already had adhesive so I lucked out on the first mirror. I purchased the Carrara Marble Mosaic tile at Lowes at $11.98 per sheet. The master mirror required four 12 X 12 tiled sheets.The second mirror cost a total of $37.69 at the approximate size of 56 W x 42 H . As you can see pictured above with the second mirror I chose a width consisting of three tiles for the frame. This look required four sheets of Monaco with Glass Mosaic tile at $7.98 per sheet and the adhesive was $5.77. Oh and never mind the shower curtain. I purchased a fabulous Nicole Miller curtain from Marshalls last week that will no longer go well with the new mirror. I am in the process of repainting this bathroom to a sand color. Turns out I was able to get five strips out of the marble tile versus the mosaic tile which worked out perfectly. I didn't spend much on supplies as we already had a trowel and sponge and again I used an old towel for clean up. You can purchase a trowel and sponge for a total of about $5. DIY'ing a mosaic frame for your mirror is a very simple and fabulous decorate it yourself task! I encourage you to give it a shot or otherwise let me know where you can purchase both a 70 X 42 and 56 X 42 mosaic mirror for less than $85.61! Haa! I also viewed mosaic tile as low as $3.98 per sheet in store so this really is a very inexpensive way to upgrade your mirror for less!